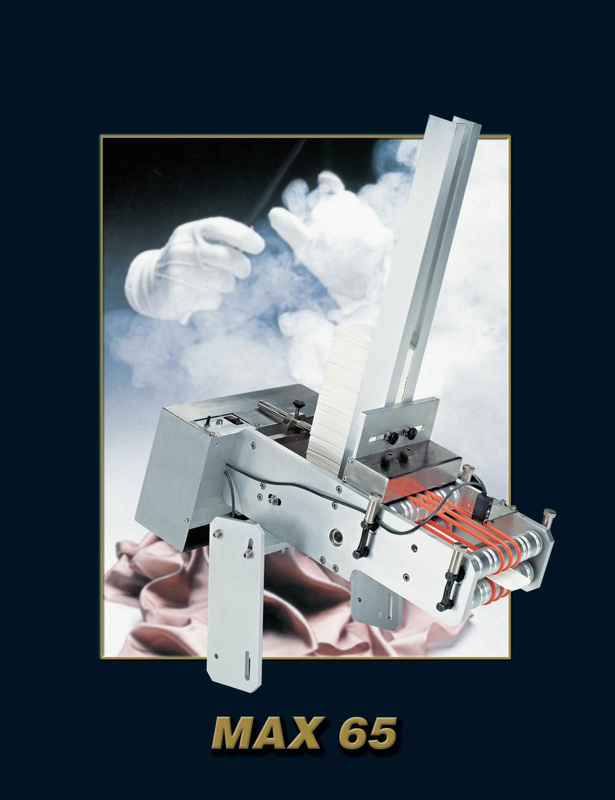 The MAX 65 is a friction card feeder to feed envelopes, coupons, computer diskettes, folded leaflets, booklets, business cards, phone cards, credit cards, etc. Polyurethane friction belts driven by a stepper motor providing fast feed and reliability. Simplified adjustments for fast and easy set up with no tools required, loading at any time by simply adding new product. Self contained and compact unit with all the controls built-in. 24" high magazine with adjustable sides. Ideal to precisely dispense items on demand, synchronized with other equipment. There is no regular maintenance required. Anodized aluminum construction with stainless steel safety covers. Product length Min 2" Max 6"
Product width Min 2"	Max 5"
Product thickness Min .003" Max.250"